Years ago at my company I worked with a team from Cordoba, Argentina. Two of the guys I worked with have a similar thirst for adventure as I do, so we kept in touch on social media even after I parted ways with my company. Now that I was finally in Argentina, I had no excuse to avoid the slight detour to Cordoba, the second largest city in Argentina, conveniently located between Buenos Aires and Mendoza. However, it wasn’t that the detour was inconvenient. 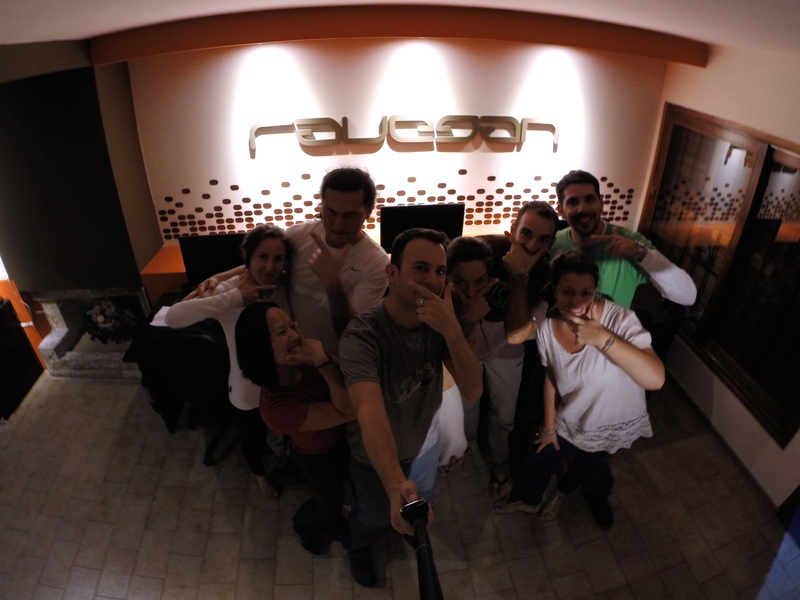 My friends in Cordoba pushed and pleaded with us to visit them and their office, and they practically rolled out the red carpet for us. 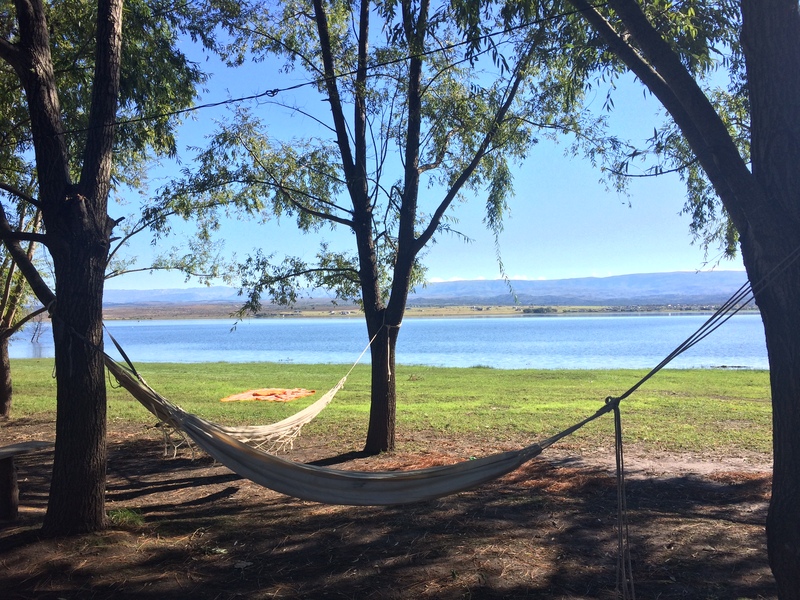 Not only did we enjoy an action-packed, comped 4-day weekend in Cordoba, we also had the opportunity to immerse ourselves in local, Argentinian life. Despite being in Cordoba, we didn’t see much of Cordoba. 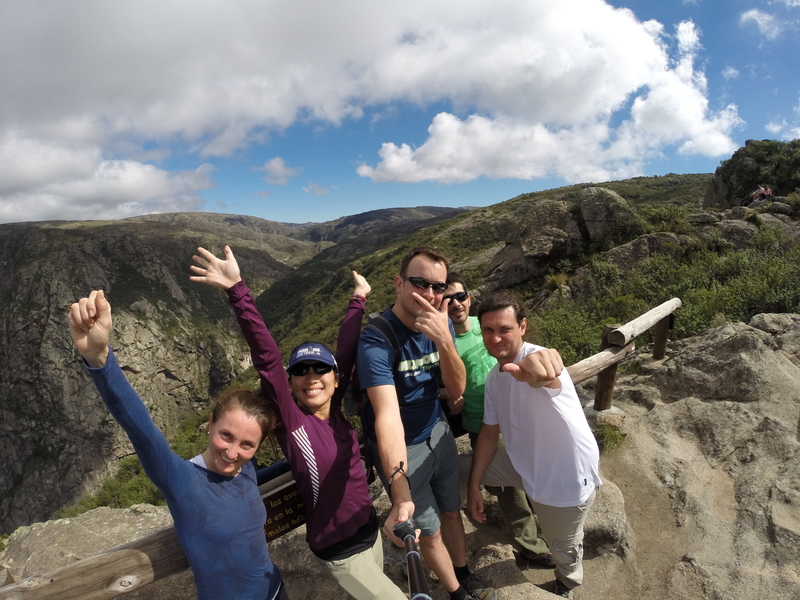 Instead, we explored the natural surroundings in the Sierras of Cordoba and spent time simply socializing with new friends. 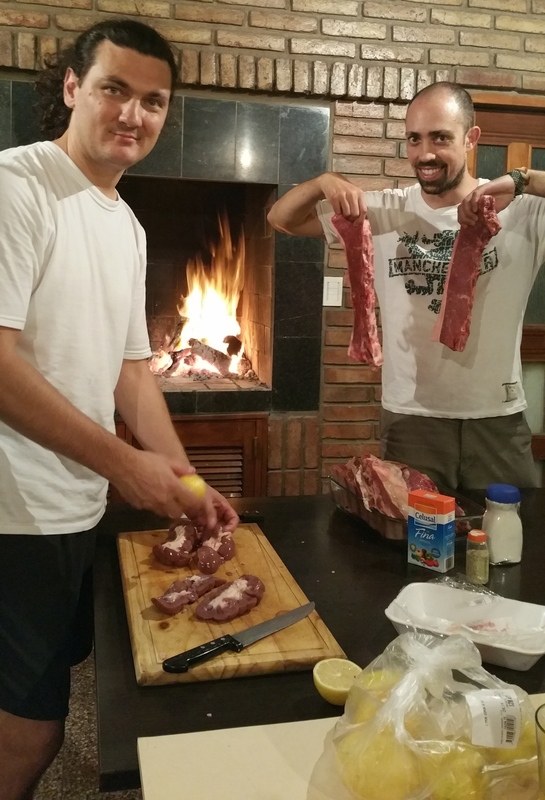 We were treated our first night to traditional asado by my friend, Daniel. 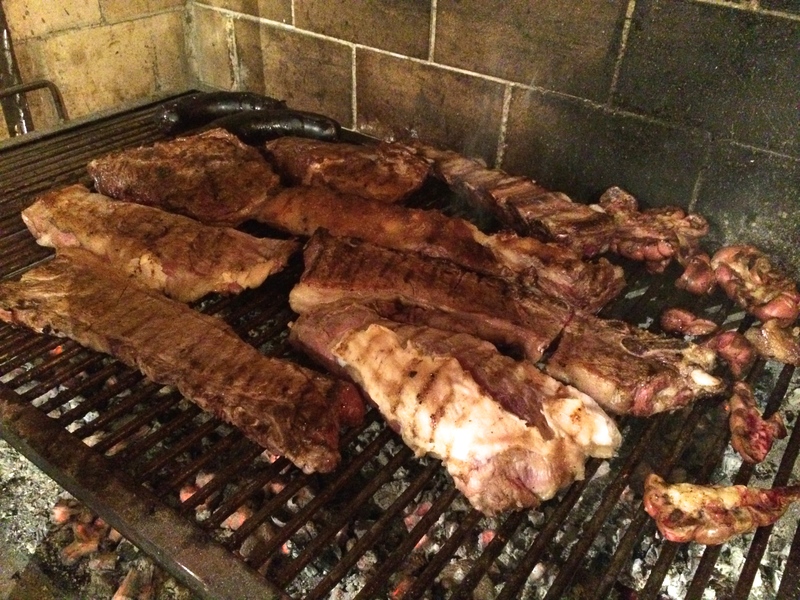 Apparently Daniel prepares asado on a weekly basis at his office for his company, Ravegan. Those lucky bastards. There was a lot of meat of all sorts of cuts. Oh my GOD. 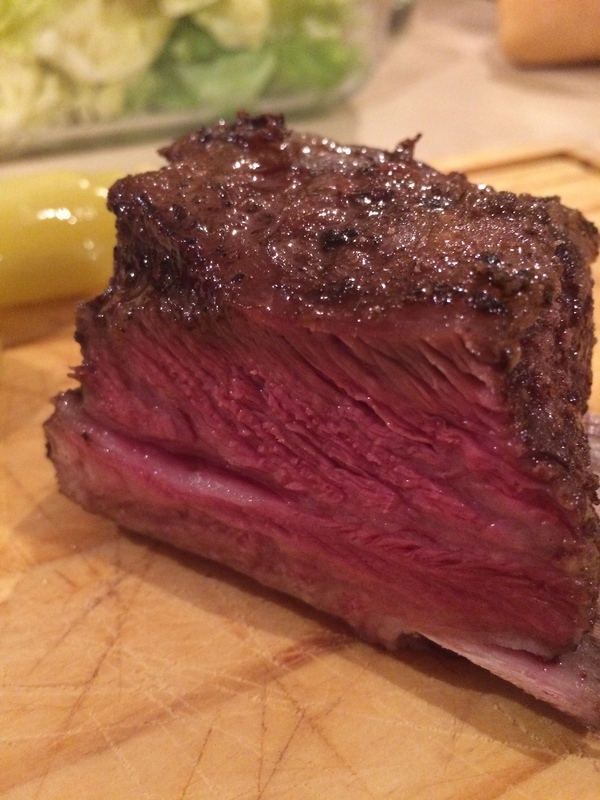 Me gusta carne! And with all these people, there were no leftovers. I haven’t mentioned it earlier but Argentinians eat their dinners late, usually 10pm or later. They are as amazed with the Americans’ early dinner times as Americans are with the Argentinians’ late dinner times. Daniel even asked me for confirmation, “When you eat dinner, the sky is still light?” As if that’s crazy! 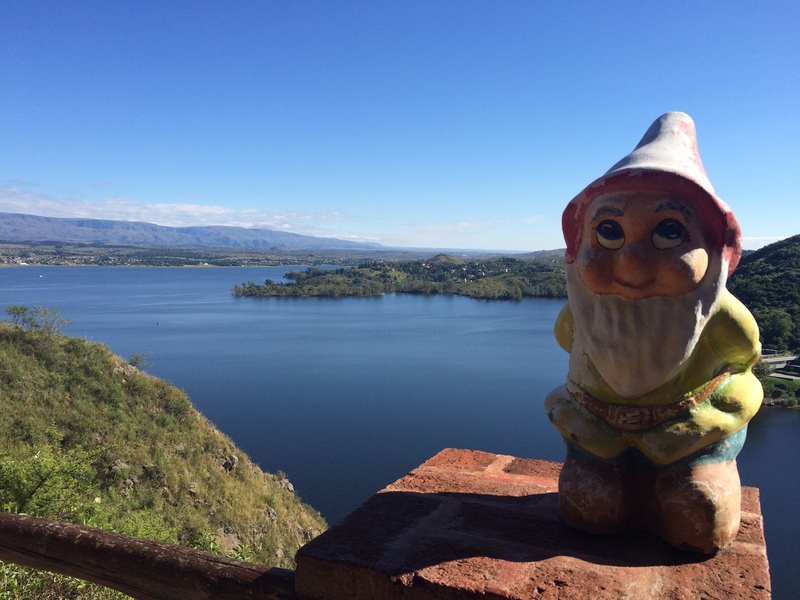 During our previous 3.5 weeks in Argentina, we never truly assimilated with Argentine culture. We never had to because it was either just the two of us or we hung out with other foreigners. And by Argentine culture, I mean meal times, meal sizes, and business hours. Whenever we ate dinner at a restaurant, we always showed up “early” at 8pm, exactly when they opened. We would typically be the only patrons in the restaurant, but by 9 or 10 the restaurant would be full, even on a regular weeknight. We were bewildered by the number of parents with their baby strollers in restaurants after 11pm, but that was the norm. Now here we were having a giant steak dinner around 10pm on a Thursday night–a work night. Many remained after dinner to socialize, enjoy wine or beer, and simply hang out until midnight. We weren’t able to get into bed until after 1am because that was when Daniel finally left to go home, only to return the next morning at around 7am to take us on a camping trip. Until this point I was oblivious to Argentinians and their breakfasts. Breakfasts don’t really exist. Well they do, but it’s typically a coffee and two medialunas (mini croissants), which is hardly a snack by American standards, followed by another medialuna or cookie between breakfast and lunch at around 11am. Chris and I awoke groggily from a late night of dinner, drinking, and socializing, assuming we’d grab something to eat on the way out. Nope. No one else ate anything, and we didn’t have our first meal of lunch until after 1pm. The variety of food in Argentina is also extremely limited. At first I thought there were only steaks, empanadas, pizzas, and sandwiches of salami and cheese because I was in a touristy area. Nope. Even with the locals, we consumed endless amounts of pizza, meats, cheeses, and bread. Despite the ultra-late dinners, lack of sleep, and nonexistent breakfast, the weather for camping was perfect. Poor gnome… I don’t recommend standing there. We spent a lot of time in hammocks at the campground. 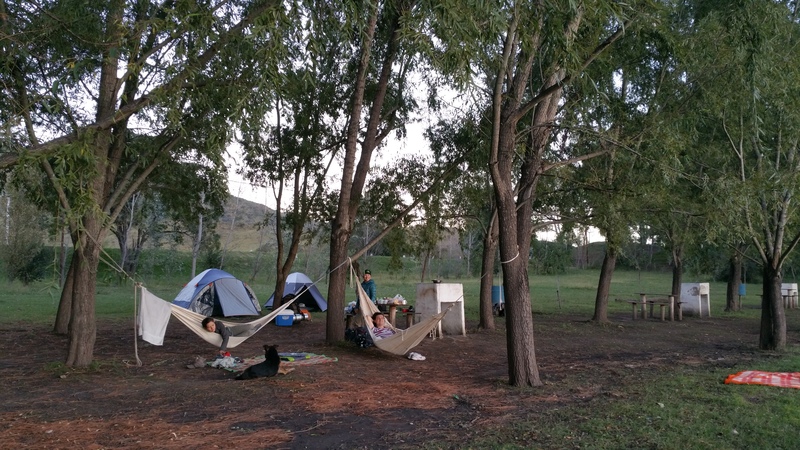 Normally after camping we return home exhausted, and we shower, eat, and go to bed early. 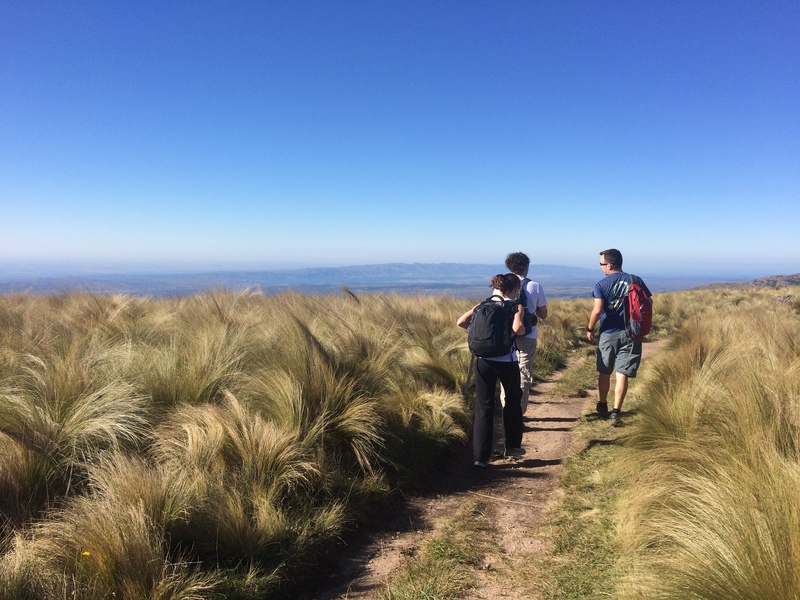 However, upon returning to Cordoba city, we were taken out for dinner at 10pm before another early rise for another breakfast-less day with a long hike ahead. We were in bed by midnight, up by 6:30am, and out again for our final full day in Cordoba. This time Chris and I brought leftover pizza with us to eat in the car for breakfast. Others were amused by the fact we were eating so early in the morning, nevermind the long hike that laid ahead. Like the day before, they all skipped breakfast and consumed their first “meal” of fruit and bars 2.5 hours into the hike. 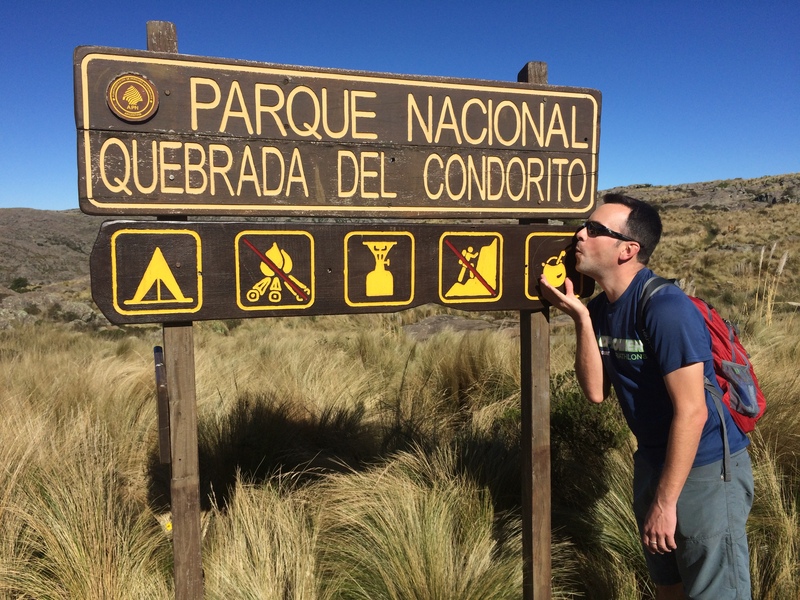 For our final day Daniel took us to Quebrada del Condorito National Park where we enjoyed a pleasant, long hike in search for condors. Low hills and grasslands make up much of the park. Condors flying overhead. 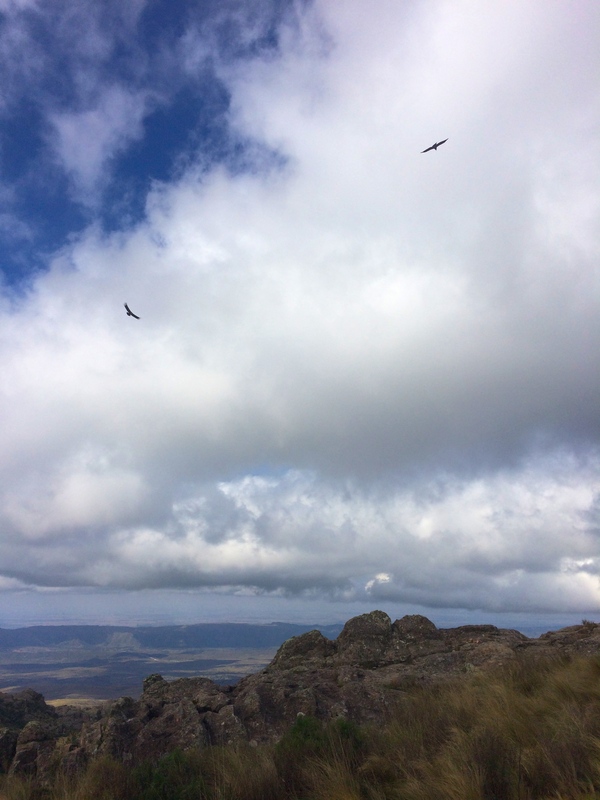 They look tiny in photos, but in reality, they are giant vultures with a wing span up of to 10 ft. long! After a full weekend of late nights, early mornings, and outdoor excursions, our exhausting trip to Cordoba concluded with a final hangout in Daniel’s office before departing via overnight bus to Mendoza. Ta mortal! 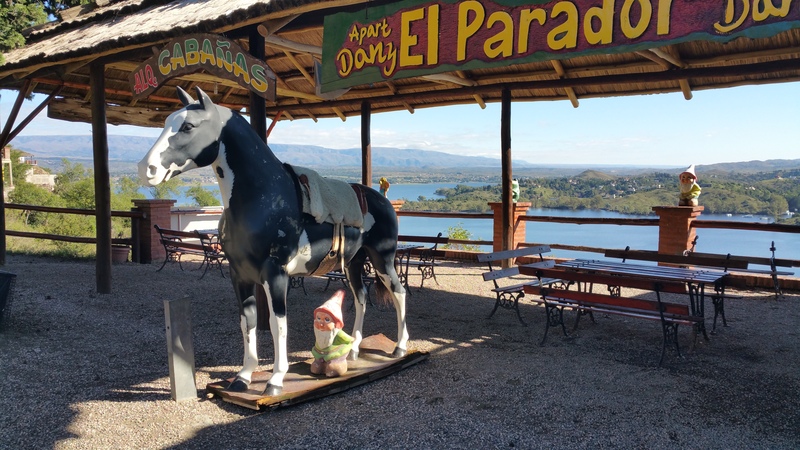 During our stay in Cordoba, we were able to see parts of Argentina that not many internationals have time to see. I was finally able to meet guys I used to work with but had never met. 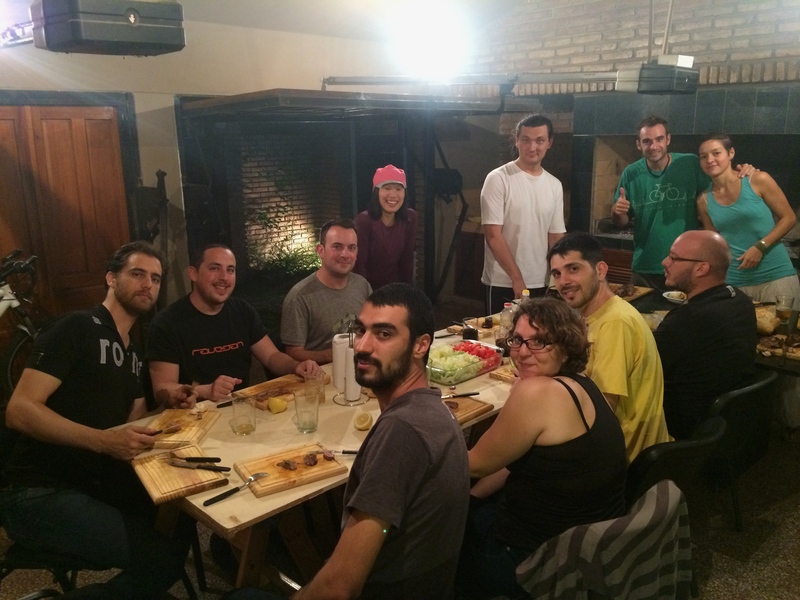 Although it was a bit of a struggle, we were able to fully immerse ourselves in the language and culture by speaking Spanish, dissecting the Cordoba accent, staying up late, eating late dinners, and skipping breakfasts. Chris and I were both grateful for having visited Cordoba, and we cannot express our appreciation for the hospitality and warm friendliness from Daniel and Ravegan.